The X350 luxury sedan was introduced in 2003 as the successor to the X308, and facelifted as the XJ (X358) in 2007. While the car's exterior and interior cosmetics were carried forward from the earlier model, the mechanics were completely re-engineered. The new car also saw the return of the XJ6 badge, with the 3.0 V6 engine. The X350 (also known as the XJ8) was offered with your choice of the 3.0 liter V6, 3.5, 4.2, a supercharged 4.2 liter V8, and a 2.7 liter diesel V6 with twin turbos. This was the first model to be built with an aluminum monocoque bodyshell which saved about 12% in weight when compared to a steel built car, even though it was larger than the X308. Although the XJ8 body was much improved the exterior sadly retained the traditional design of previous models with double headlights and a curvy body which hurt sales as the outer body hadn't changed much since the XJ40. 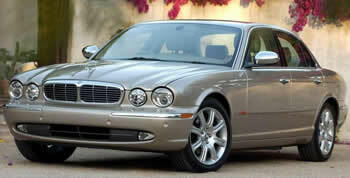 Production of the XJ8 lasted until 2007, when it was facelifted and rebadged as the X358. The X358 was produced until 2009. We have the most accurate Jaguar parts catalogs on the internet so that you are able to find the correct part for your car every time.